Below is the 2018 season recap for the Minnesota Vikings. 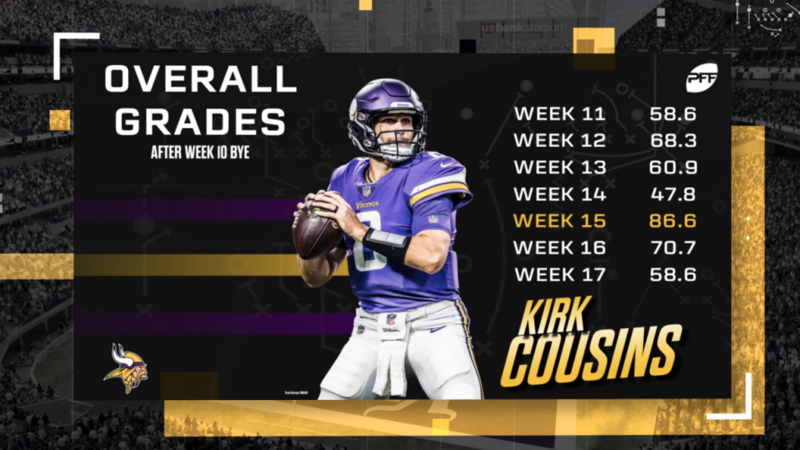 Kirk Cousins proved not to be the answer as seemingly every position group outside of wide receiver took a step back for the Vikings. They finished 8-7-1 and missed the playoffs a year after playing in the NFC championship game. Adam Thielen and Stefon Diggs formed one of the most dynamic receiving duos in the NFL. 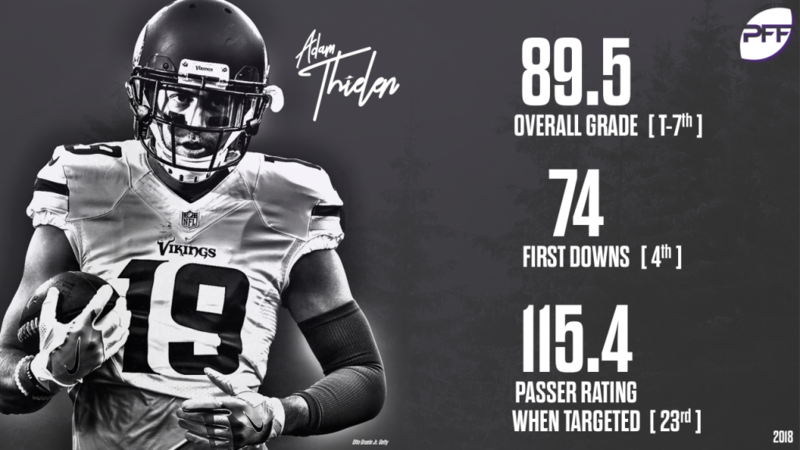 Thielen produced a career-high 89.5 overall grade and a 115.4 passer rating when targeted. 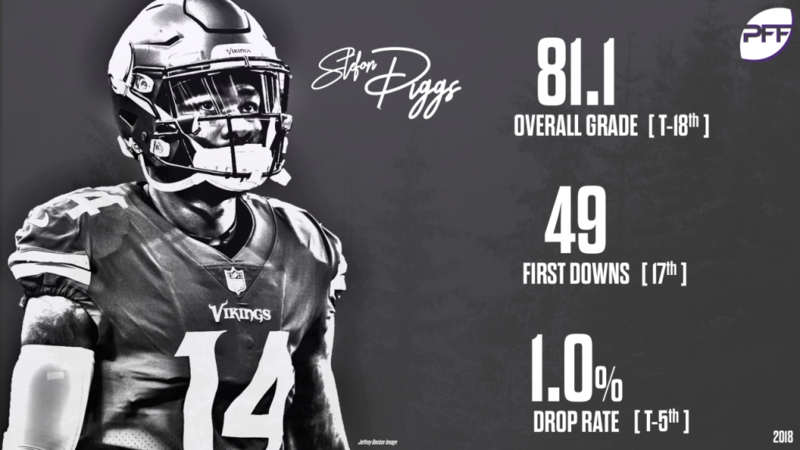 Diggs was not far behind with an 81.1 overall grade and only one drop on 103 catchable targets. 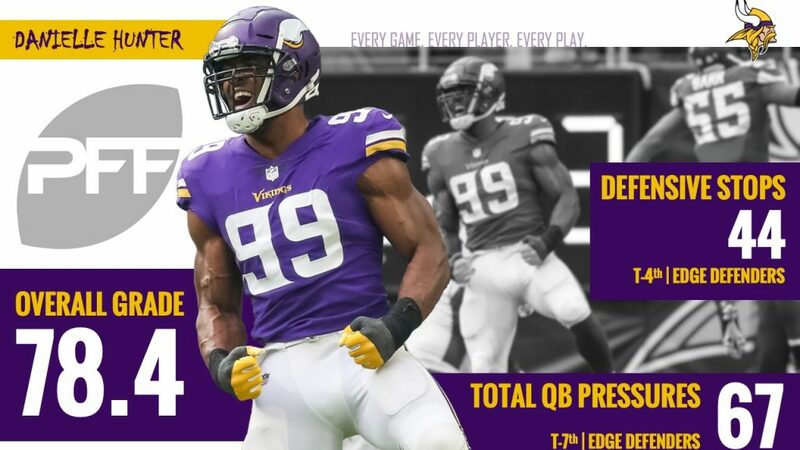 Danielle Hunter continues to ascend, as he finished tied-for-fourth among edge defenders with 44 defensive stops and tied-for-seventh with 67 total pressures. 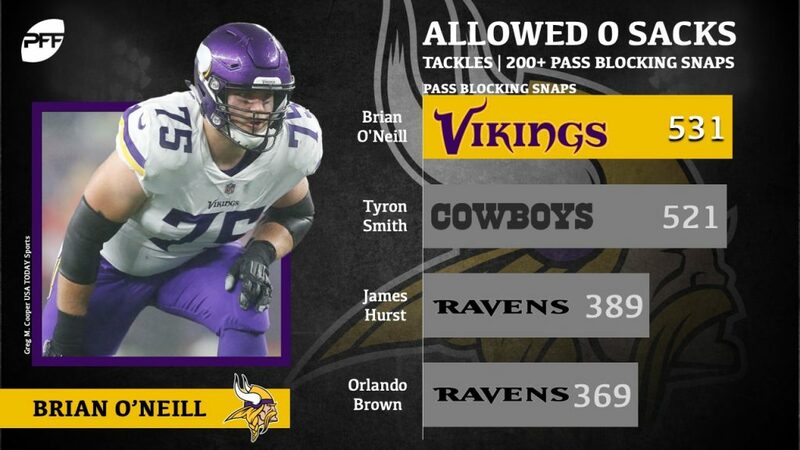 Although he posted a mediocre 63.0 overall grade, Brian O’Neill stepped in to provide stability at the right tackle position by logging 800 total snaps. He was one of four offensive tackles that lined up for 200-plus pass-block snaps without allowing a sack. The interior offensive line. Starting guards Mike Remmers and Tom Compton combined to allow a staggering 77 total pressures. 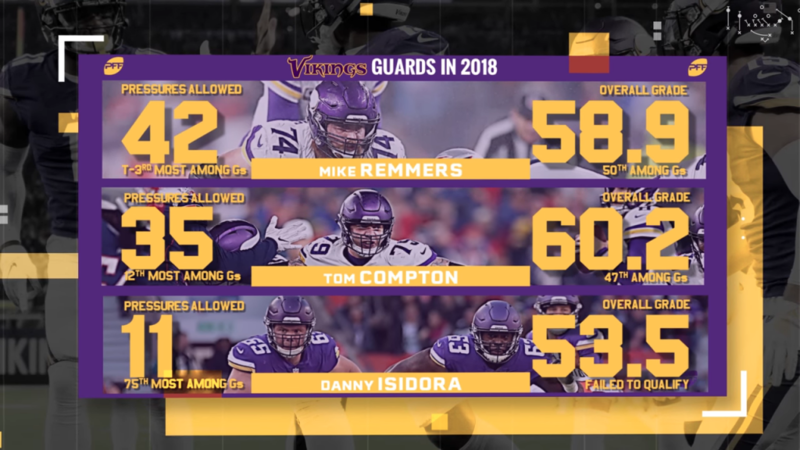 Remmers finished with an overall grade of 58.9 (50th among guards), and Compton was only slightly higher at 60.2 (47th). Running back Dalvin Cook struggled to stay on the field by seeing action in only 11 games. However, he was elusive when he had the ball, forcing 47 missed tackles on 173 total touches. Kirk Cousins failed to produce when it mattered most. Following the Week 10 bye, he produced a grade of over 71.0 only once during the final seven games. Xavier Rhodes battled through injuries for some of the year, but overall, he recorded the worst overall grade of his career at 58.2 (104th of 119 cornerbacks that logged over 300 snaps). His catch allowed rate of 65.2% was by far the worst of his six-year career. Thielen started the season like a house on fire with eight straight 100 yard games. He would only finish with one more the rest of the year but still racked up 1,373 receiving yards. Harris was a revelation over the second half of the season. He notched three picks and two pass breakups compared to only seven catches in his coverage. 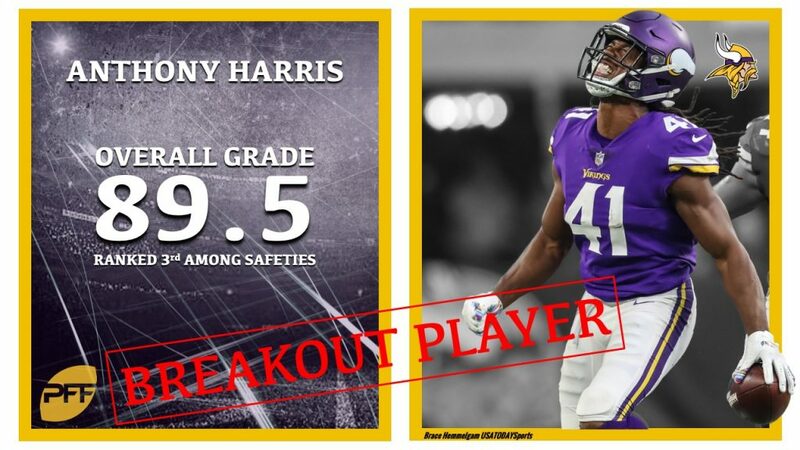 Safety Anthony Harris stepped into a starting role from Week 8 to the end of the season. His 89.0 overall grade led the Vikings defense and ranked third overall among safeties. Second-round right tackle Brian O’Neill was forced to play early and often for the Vikings lackluster offensive line. He allowed 31 total pressures but didn’t allow a sack in 531 pass-block snaps. The talent is still there, but the Vikings need a quick turnaround on the offensive line to get the most out of Kirk Cousins.